View cart “Omega 3” has been added to your cart. 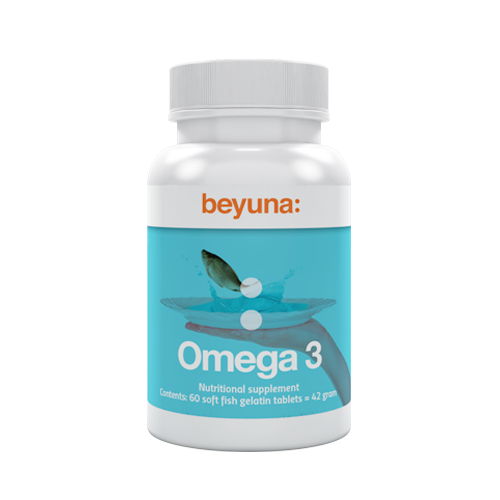 Beyuna omega-3 is rich in high-quality, pure fish oil. The fatty acids in the omega-3 family include alphalinoleic acid (ALA), eicosapentaenoic acid (EPA), and docosahexaenoic acid (DHA). EPA and DHA contribute to the normal function of the heart. DHA contributes to maintenance of normal brain function and normal vision. The recommended daily allowance for adults is 2 capsules per day. Take 2 capsules per day with water, preferably at mealtime. Beyuna has opted for a TGN fish oil from EPAX. With only clean, sustainable and traceable raw materials, EPAX delivers safe, pure Omega-3 fish oil that has been scientifically proven. EPAX was the first Omega-3 producer to be awarded the Friend of the Sea sustainability certificate five years ago. EPAX stands for Purity, Quality and Innovation. Beyuna has opted for a pure fish oil supplement with TGN fish oil from EPAX. TGN stands for Natural Triglyceride fish oil. There are different types of fish oil available, ethyl ester (EE) and triglyceride (TG).Triglycerides, the natural form, consist of three fatty acid chains attached to a glycerol molecule. This is the molecular form in which all fats and oils occur in nature. Ethyl esters (EE) consist of a single fatty acid chain, replacing the glycerol molecule with an ethanol molecule which makes it unnatural. Ethanol molecules attached to ethyl ester do not break down as efficiently in the body so that the bioavailability factor (absorption of the omega in your body) is lower. Lipase from the pancreas splits natural triglycerides 10 to 50 times better than ethyl ester. Research shows that ethyl esters are absorbed 27% less than natural triglycerides. Therefore, Beyuna opts for TGN, the most natural form of fish oil, which is well absorbed in the body.